Discussion in 'Contests' started by littleedge, Dec 9, 2011. Voting ends on December 31 at 11:59 EST. Who the hell made the most appealing track around a dreadful track? Was it Grazr? Loc_n_Lol? Wimples? Has the English Mob persuaded everybody to vote for him during the month I've been away? Or did Sergis make my track not craptastic? You will decide! [Click the above five names to download the five entries] Three of them will walk away with money in their bras, and two will stay manly, earning it from that thing they call "work". Detail (20%): How pretty is the map? Is it shiny? Do you want to make it your background? Balance (25%): Does RED kick BLU in the face even if Flame, Super, Nine, and nine others are on BLU and a F2P is on RED? That's probably not good. Technical/Performance (10%): Is it even remotely optimized? Do all doors work? Are cubemaps properly placed and built? Track Usage (45%): Does the track feel like it's a part of the map? How well did they utilize the track? I suggest you use the following table. If you have comments, feel free to add them below your scoring. Just close the last Table tag. Voting ends on December 31 at 11:59 EST. Winner announced after votes are added. I'd just like to commend all participants on a good job all round. This competition focused on the track usage and I think all mappers took this on board and integrated the track nicely on all accounts. Eng Mob's Nippon really blew me away in terms of visual detail. That map definitely COULD be a wallpaper. The waterfalls were particularly beautiful. It was also particularly well optimised; despite the high quality visual effects my mid-range laptop kept the FPS steady during my entire playthrough. By far my favourite map of the set. The wood theme was nice on Sergis's map and I thought the track fit in particularly well here. The only thing that I didn't like was that I thought it was a bit too uniformly textured, but overall it was a great map. Those are really the only comments I have, all were really good ^^! Certainly the prettiest map, in my opinion. Balance is an issue, however; it was very rare to see BLU push all the way to the end. I think I saw it happen once or twice, but usually RED defended pretty well. The lack of cubemaps on some objects was an unfortunate oversight, which is why I docked you a point on the technical aspect when nearly everyone else got 7. Overall, it was a fun map, however. There was a rock that I always caught on when pushing the cart right at the very beginning, but everything was minor and I always found myself having fun. Probably my overall favorite. The map was not detailed nor particularly balanced (BLU always won), but DAMN, was it fun. It wasn't pretty, but it was damn fun, and that's what really matters. Despite its balance and lack of detail, I had the most fun on this map out of all of the rest. That is why I would say it's a solid second, despite its shortcomings. Your map was probably one of the most polished and well-balanced out of the group. Something about it, however, turned me off whenever I played it. At times, it felt like every corner had a similar character, that I didn't really feel a sense of "progress" CP by CP. It was largely well-detailed, except for that blocky artillery cannon that perhaps deserved a custom model (hence the docking of .25 points). It felt like RED defended as much as BLU succeeded at winning, and there weren't any areas that were dominated by a single class. It was well-balanced and well-polished, but I think in seeking that perfect balance and formulaic gameplay, it lost a lot of that crucial "fun" factor. I found myself growing tired of the map about 20, 25 minutes in, typing !nextmap to see what the next map is and how much longer it would be. I never had a chance to play this map more than twice, early on. Because of that, I really don't have much to say other than the fact that your textures seemed to tile a lot, and that bugged me. It felt to me a lot like Grazr's map: Well-balanced, yes, but maybe not FUN. I also found myself getting tired of the map after a little while. All the wood began to hurt my eyes and although unique setpieces like the dish were nice and the map was extremely well-balanced, I found I wasn't having FUN. I would place this map just behind Grazr's. What happened was that I popped a stickytrap the moment someone was about to push the cart into the hole. The cart "fell," but didn't hit the trigger and instead stuck there, unable to be pushed. 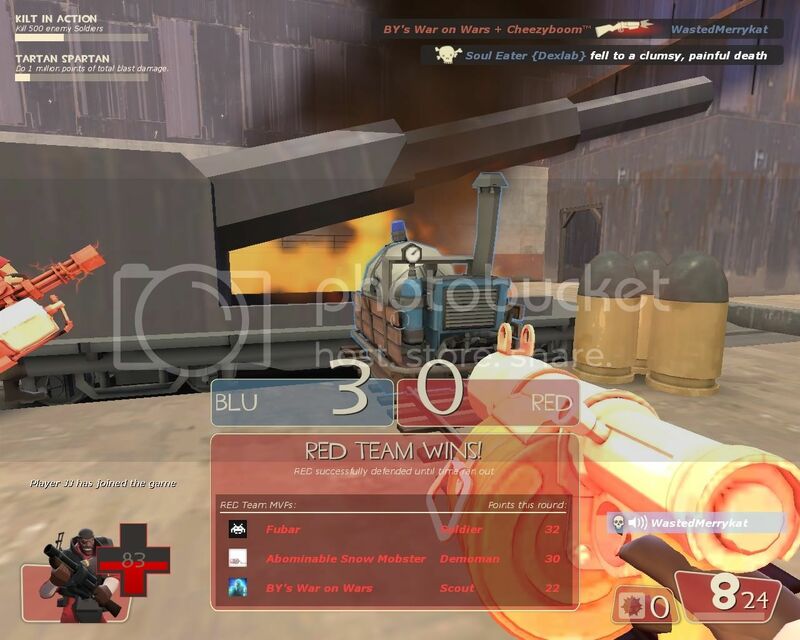 Since it didn't hit the trigger, BLU never won. They also couldn't move the cart and so couldn't activate the trigger themselves, even though they technically "won." So we were forced to wait out the time limit even though BLU had pushed the cart to the end. I'm changing my technical rating in light of this. grazr: Really fun to play, loved the lighting and architecture, but the detailing and gameplay sort of broke down towards the end of the map in my opinion. Also, there was a complete lack of background noise in some areas that was a little odd. Definitely the most balanced of the maps. Locnlol: My personal favorite gameplay-wise and visually. A bit tough on the attackers at the very beginning but a blast to play and makes very good use of the track. Wimples: Plays great, would probably be my top pick if it were finished. Unfortunately, it's mostly dev textures at this point and I can't give it full credit. Engmob: This could've been the prettiest of the entries, but it wasn't finished. What was done was beautiful, but I want to be fair to those who finished their maps. I thought the big open room around the winding part of the track was a bit of a cop out. Also, it crashed the server twice. Sergis: Adequate overall, not fond of it. Didn't do anything particularly badly, but didn't do anything particularly well either. For Grazr: This is why I rated a 2 on technical. Blue couldn't win. The cart exploded and it was still Reds point. Time ran out and I lost. That's not even how the payload finalé is setup, so that's not what happened. The round is won when the train passes the second to last path_track, the train and movement trigger is killed and the physics constraint is released to drop the payload, this all happens after the path_track is triggered and the game is won (i know because i set timed delays after the win trigger to avoid the train being killed before the game could win). This is a known payload bug that happens occasionally and has nothing to do with the map. Also the artillary is a place holder, i would have thought people would understand what a place holder was. Just like YM's brushwork dinasaurs in tc_strata, they aren't intended to be the final iteration. I'm compiling my scores atm and i'm wondering whether it's appropriate to include semi-in depth reviews with the scores or just drop them into the respective threads. Well I haven't really seen that happen ever. I loaded up your map and it just so happened that's how it worked, so I figured "Well, it's broken." The fact that it happened twice with two different people, well I don't know. If you'd like a full in depth review I'll gladly write one. You can write a review if you want to, it'd be helpful for me to see things i can't see now (like proof reading). At the moment I feel that my map has it's fair share of flaws, CP's 2-3 is a real weak spot gameplay and detail wise in the integrity of the map, but some of the things it's actually been marked down on feel to me to be odd nit picks of no real consequence or bugs that happened once and cannot be replicated/are known gamemode bugs that occur on all working custom maps now and again. The most balanced map in my opinion, the map shifts its favour from the attackers to the defenders and vice-versa at crucial points in the map so neither team has an overwhelming advantage over the other for a long period of time. I particularly enjoyed the final point as it led to some very tense moments of gameplay several times with the fate of the game hanging in the balance over a final suicidal push by the attackers. Detail wise its fairly solid with the quality dropping at the final point, but since this is fairly minor no marks have been deducted. A lot of thought has gone into controlling the LOS in the areas and there are no major sightlines and performance stays good throughout the map. The areas around the track work very well and everything feels like it it transitions smoothly. Overall my favourite of the entrants. I didn't play this map as much as I would have liked but I tried my best to come up with some feedback. Of the few games I played RED seemed to win most of the rounds but this may have just been the product of the teams being unbalanced. Some areas seemed to be very much in favour of RED and it took a hard push to break through the defence there. Detail wise it was pretty nice but it didnt exactly stay consistent, some areas were well done while others had been neglected. There were a few areas which felt fairly open and while snipers couldnt exploit sightlines due to props being in the way the areas still suffered from bad optimization. Cubemaps were missing which was unfortunate. The first area was very nice both visually and gameplaywise but along the rest of the track the areas got fairly boring and repetitive. This map didn't feel particularly balanced as in my experience RED nearly always won, defeating BLU either at the first CP or the final one. BLU has a fairly large walk time to the last point and it was fairly easy for RED to defeat the attackers as they reached the final cp area so attacking just turned into a cycle of walking to the final point and trying to wear down REDs defences only to die and then have to walk back there again giving RED time to renew any losses to their defences. It was mainly in dev so not many marks for detail. Map performs well optimization wise and everything works apart from a few gates managed to trap players occasionally. The areas around the track work pretty well up until last where they are of limited use to attackers and BLU are easily flushed out by defenders. 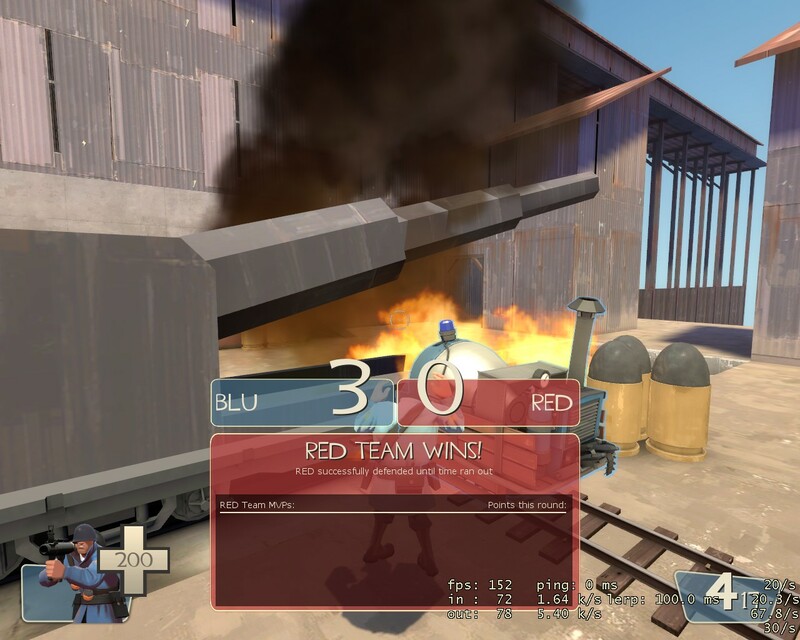 This map heavily favours RED throughout, several rounds I played consisted of RED trapping BLU in their spawn area, locking it down with snipers and sentries. If BLU manages to get past cp1 then they have a slightly easier time of it regardless of some large sightlines but the last point is a real problem. 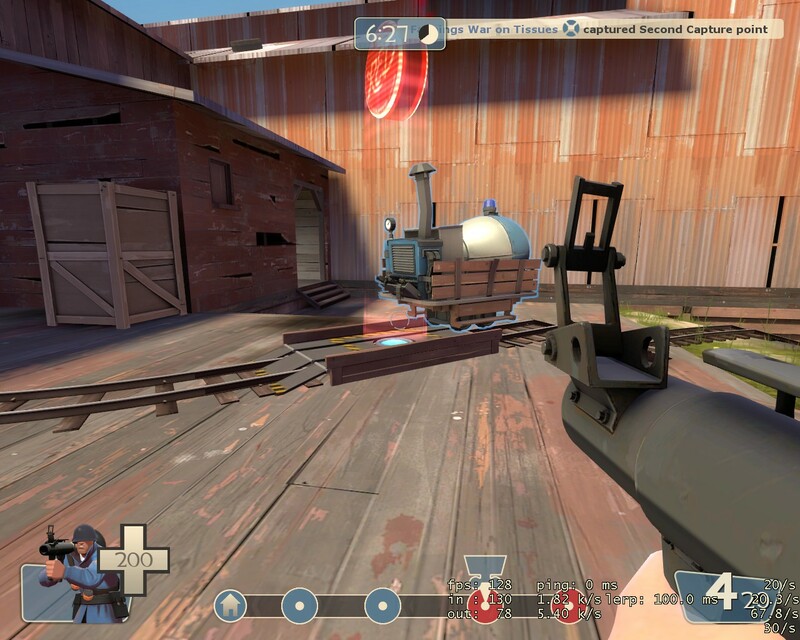 I think there were about 2 almost impossible to defeat sentry spots in the final area and generally the lack of good flanking lets it down even more. The map overall has some rather large scale issues which also has a huge effect on optimisation. You could see the final area from just outside the BLU spawn. Overall I didn't particularly like it although the startings of the detail were quite nice regardless of all the mis-aligned textures and dodgy displacements. I don't have a lot to say about balance other than it played alright and there wasn't much in the way of fun gameplay but it was solid regardless. Detail wise the map was haphazardly detailed with lots of very blatant tiling textures with quite a few holes in places where you could see the skybox. Quite a lot of the map feels quite cramped and the flanking routes don't seem to help pushes all that much. Probably not very helpful feedback on the maps but it was the best I could come up with. Spawning as BLU certainly wet my whistle in terms of detailing, but unfortunately the level was not sustained throughout the map. Often corridors are left bare and large portions of walls outside are without windows, decals or complimented with other building/junk type props. Roofs are also noticeably bare, detailed only with snow. Some tires, metal sheets and melted bare patches would have been nice. There's also a distinct lack of visual progression throughout the map. It goes from generic concrete industrial in the BLU spawn to consistent red wood shacks there-after. It would have been nice, and appropriate, to have seen an industrial segment implemented at the finalé. Though I've barely played this map the win ratio weighs 75% in RED's favour so i'm gonna have judge mostly based off of that statistic rather than my limited gameplay experience, where I might have been able to determine any specific imbalances and provide some advice. The map has at least some semblance of class balance but these are often location specific, allowing for limited alternative tactics. I'm not a fan of detail getting in the way of players trying to push the cart and at multiple locations rocks obstruct BLU players and often in a tangible detrimental manner, where BLU are unable to use the cart as cover. Sometimes it can be used as a mechanic, on purpose, but the frequancy of this makes it feel more like that the map is just claustrophobic. 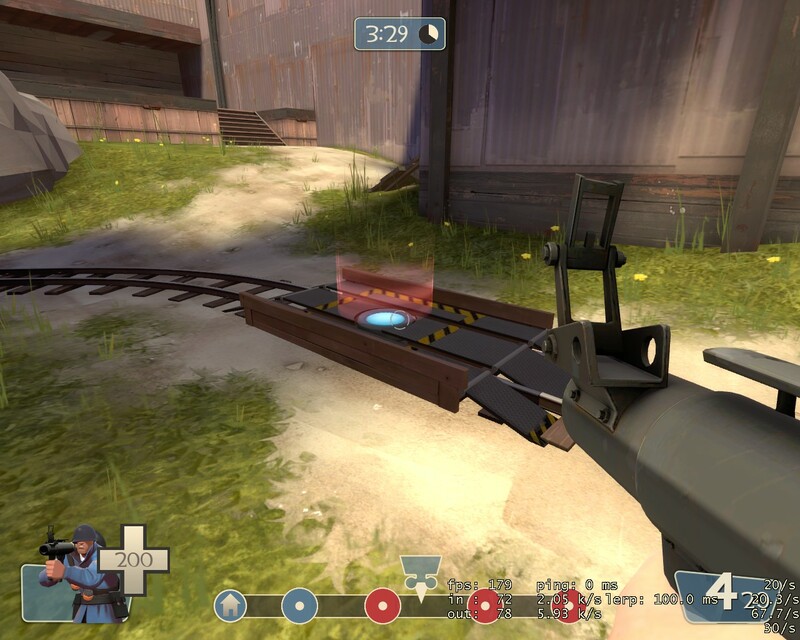 The map is also largely open, although fences block direct fire and prevent snipers from exploiting large LoS's, performance is not addressed by these gameplay solutions. Performance wasn't particularly choppy but then the map clearly isn't finished going through art passes. The start of the track is very pretty but much of the surrounding structures have open bays and this gets a little repetitive, both visually and gameplay wise. The track goes from having sufficient and acceptable space to being blind sided by rocks or dodgey displacements by curves. I don't understand how i've barely played this map even though it appears to be the most developed of the 4. I wish I could have been more critical of the map. Regardless of DEV textures, with miss-matched textures, unaligned textures, miss-matched props and jaggy displacements I find it hard to score this map high in detail despite the effort done in attempting to execute a custom theme. It may have been prudent to focus your attention on important parts of the map, like the spawns, elevator and finalé, if you did not think you could complete your first artpass. Given the lack of space it would have also been worth using some smaller grid sizes in hammer. A lot of your geometry is chunky and cumbersome. The map favours RED tremendously. Many rounds are spent by RED camping BLU at their spawn which shouldn't be a common occurrence for the first area of the map which should really favour BLU. If BLU are to get past the first CP, it's easy street until CP-3, the next significant choke point. From there on out it's a battle of attrition through some dodgey layout/geometry, past RED's spawn, and an almost invulnerable SG position outside the RED spawn door and under a ledge which forces BLU to put their back to the objective and expose themselves to mobile defenders. Most caps here are either ninja'd by a bonk scout/spy or simply an overwhelming show of force by BLU should they get an uber through the final choke. The map needs some serious scale addressment and some more defined flanking routes. Those at the end are hidden in crevices or far away corners and those near the start are so out of the way it doesn't even look like play space. You can tell a subtle class imbalance because at current scouts and snipers are particularly powerful and demomen sticky jump past CP1+2 in one go and head for RED spawn/harass the flanks freely. The map is so open you can see the finalé and RED spawn from the BLU setup gates. If the map were to be fully detailed I would fear for performance issues. With the layout implemented with little consideration for optimisation I cannot score it high for technical. It feels very much like you made a map and then plunked the track in because the track doesn't feel to comfortably fit all areas of the map; and with the final choke being inappropriate geometry because of the awkward track I couldn't score high here either. Some parts of the map I wanted to score 2 and others I wanted to score 3 or even 4. But with misaligned textures, schizophrenic attention to finer details, mostly blank walls and holes showing the skybox between displacements and behind props I couldn't justify scoring it higher than i did. In general the map is a bit of a mess, you get caught on odd bits of geometry and some spots that look like you can't pass through or walk around, you can. The lack of one way gates leaves the entire map open to people who sticky/cloak past defenders. If the map had more barriers and better control via one-way gates the balance and gameplay would be a little more consistent and fluid. All in all the map plays weird and even though the ability to rocket jump past vast portions of the map at a time, classes do seem to be relatively balanced against each other. As I said to english_mobster, little has been done to control LoS for the sake of performance meaning large portions of the map render at any one time. The maps acceptable performance is only a result of the lack of significant art passes. Some of the track plays better than it looks, but there is a serious need for space, and this is relative to balance too as RED tend to win the majority of the time. Flanks need to be more defined but because of all the chicken wire one gets confused as to which way is forwards. The track has some obstacles but they largely feel like gimmicks, stuck in tight spaces with no breathing room and visually undefined/developed. Not much to say here, the map is still largely in DEV so I can't justify scoring more than half the points I could offer. Egypt theme is nice, but there's nothing to see yet. Walking distance to the finalé is a little excessive and it's very difficult for BLU to hold any ground, RED frequently clear out the map up to BLU's advanced spawn and with superior health and ammo drops it's clear to see why RED medics are more likely to survive to pop an uber than BLU ones. Only a clear difference in skill or luck allows BLU to push through the battle of attrition here. Disappointingly the final fight is usually BLU throwing their bodies at the cart one at a time (since large groups are easily spotted and intercepted well before they can reach the cart) and hoping RED demomen/soldiers have to reload longer for longer than it takes them to push it to the end. A more sophisticated fight would have been pleasant but the BLU travel distance matching RED's spawn penalty both teams are on even ground. I've seen excellent BLU play, spies killing medics and snipers, demo's getting the SG all in one assault and still 1 unprioritised heavy/demo can finish off remaining BLU attackers, resetting the status quo for another minute. Other than the boring/repetitive battle of attrition for last, CP1 is also particularly problematic. Many games will end here as a result of superior height advantages and health and ammo drops (BLU have NO health or ammo up to CP1). Plus ninja capping CP1 is out of the question as the door closes behind the cart, creating even more of a choke for BLU to pass. I scored low because of the significant RED advantage at CP1 and the easy-street push through CP's 2 and 3 for BLU. The difficulty at last is kind of acceptable because it is the finalé but it's not particularly fun gameplay because of the aforementioned issues. Everything works and the map is executed with performance in mind but the short-cut gates have a nasty habit of trapping players. I would have scored a 6 or 7 were it not for the spawn doors. The track has plenty of room at most locations and the flanks are reasonable up to the last where they're out of sight (and out of mind). Disregard any rounds where no more than 10 players played and that leaves barely 3 rounds, 2 of them won by BLU, on the submitted version. Yeah RED tends to win by default when there's no one playing. Also @Vincent, as I explained in the other thread, cubemaps were compiled but the LDR ones were mysteriously left unpacked.